The first two years of the Obama Presidency have been amazing. Despite the obstructionism of the Republican Party, the President has secured historic results for the American people. In some cases, like health care, his success capped decades of work by Democratic leaders. The highlights are below. For over a century our nations leaders have struggled to reform our health care system. President Obama got the job done in 2010, passing historic legislation that will ensure that ever American will have access to affordable, quality health care. During the campaign Obama pledged to end George W. Bush's tragic and misguided war in Iraq by August, 2010. 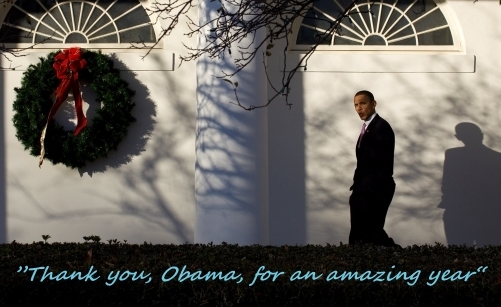 He did, right on schedule, saving American and Iraqi lives as well of trillions of taxpayer dollars. President Obama inherited an economy in freefall from George W. Bush and the Republican Party. Thanks to the President's leadership we were able to avoid a second Great Depression and create over 3 million jobs. President Obama lead the passage of the most sweeping reforms since the Great Depression, to hold Wall Street accountable, put an end to bailouts and "too big to fail," and enforce the strongest consumer protections in history. This was the first piece of legislation the President signed when he took office. The Act affords women the full protection of the law in making sure they are paid fairly and equally by employers. The President successfully championed the repeal of a discriminatory policy that weakened the military by having qualified soldiers discharged because of their sexual orientation. President Obama succesfully championed a landmark investment in higher education by raising student aid, making loans directly to students rather than through corporate middlemen and investing in community colleges.